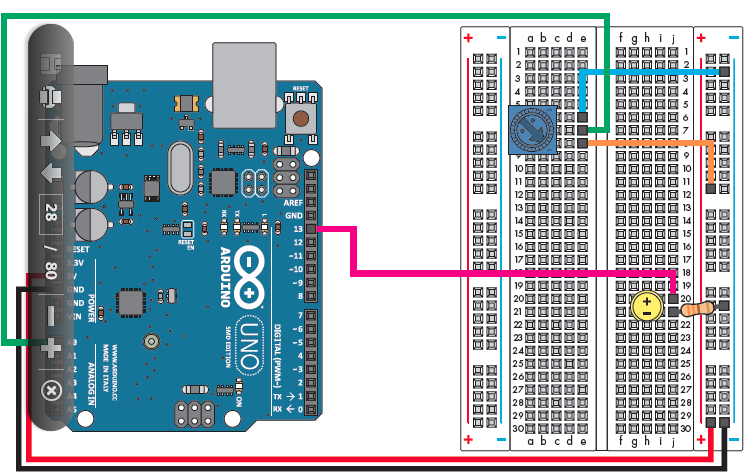 How to work with analog sensors, Arduino and Processing. 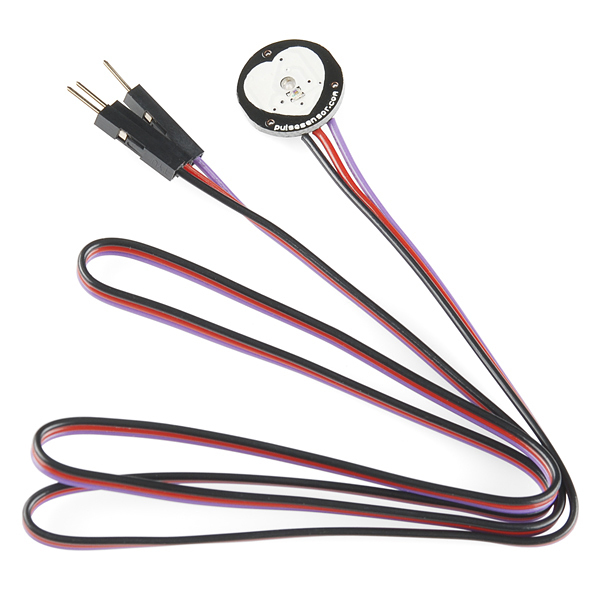 A sensor is a device that measures a physical quantity and converts it into an electric signal. They can be analog (working like potentiometers) or digital (working like switches). Some examples of analog inputs. To introduce the analog input we are going to use a potentiometer. It’s sometimes referred as “pot” by people who don’t smoke weed. They are usually trimmers (think about the old radio knob) or sliders (think about a audio mixing console). It looks like a resistor because it is a resistor, a variable one. The third pin (W in the scheme) is mechanically movable and correspond to the angle of the trimmer or the position of the slider. Potentiometers have 3 leads, the 2 one (usually in the middle) is the one to probe as analog input. The other two should be connected to +5 and mass. Analog means continuous value as opposed to digital where you have 0 1, LOW HIGH, 0V +5V. 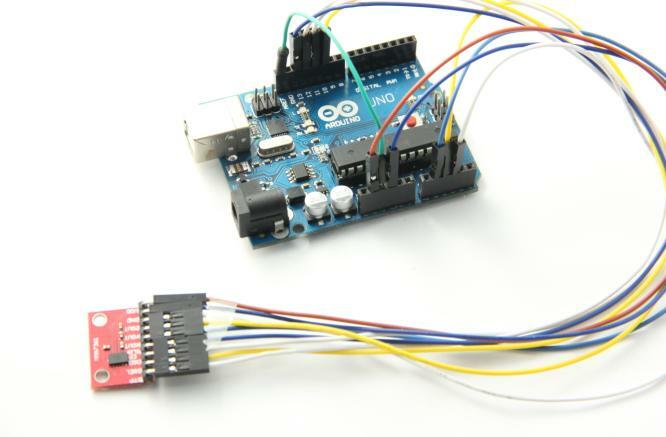 In the Arduino environment it’s an integer value between 0 and 1024. 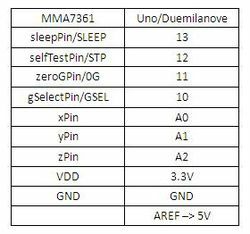 Note that Arduino has a special set of pin to detect analog inputs marked as A0, A1, A2 etc. 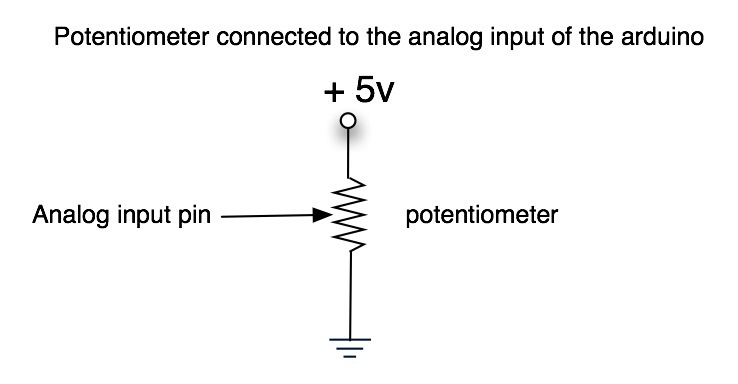 The orientation of the potentiometer will determine the relation between value and know/slider position, try to invert it and see what happens. In this variable blinking exercise the pot is controlling the delay therefore the blinking speed. sensorValue is a value between 0 and 1024 so the blinking will go from 0 delay (LED always on) to 1000ms of delay (1 second on, 1 second off). Let’s try different potentiometers and sensors now! Replace it with the flex sensor, it should work the same way. (this circuit has a pushbutton as well, that’s a digital input). Photocell are basically resistors that change its resistive value (in ohms Ω) depending on how much light is shining onto the squiggly face. You can use in a laser tripwire. Reading analog value to control an analog output: an LED in Pulse Width Modulation (PWM) variable brightness. 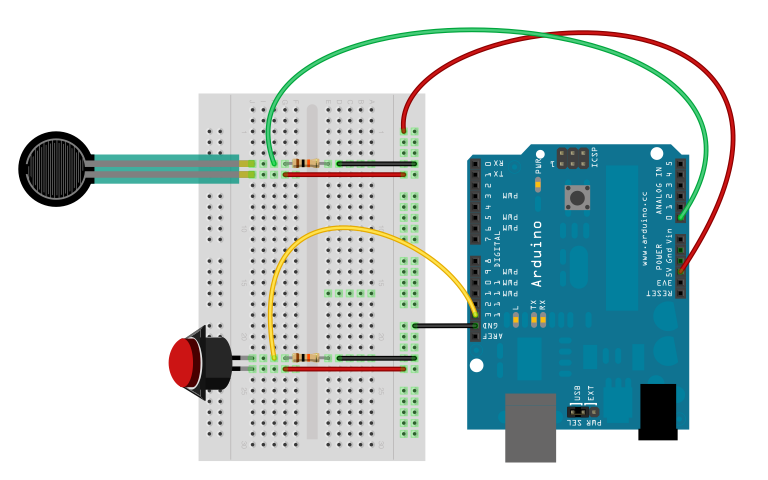 The instructions to make arduino talk to Processing through Firmata are here. 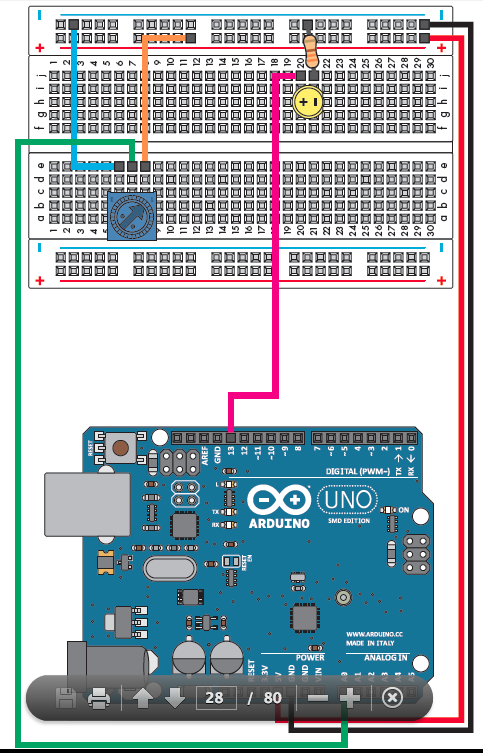 1- Unzip the Processing library and copy the “arduino” folder into the “libraries” sub-folder of your Processing Sketchbook. and upload it to the Arduino board. 4- Run the processing sketch below. Try to combine this with knobs (aka potentiometers). You can write your own serial communication protocol without using Firmata in case you have very special needs. Here’s an example with two analog inputs to processing. Similar to what you have on the wii or iPhone. Senses acceleration in 3 axis, if calibrated detecting the inclination on a plane. This sensor is well documented.